There are more than 10 kilometers of sandy beaches on the Venice Lido. Lido can be reached within half an hour by boat from almost any point in Venice. In the event that you find yourself in Venice on a day so hot that you forget where you're going the minute you leave your B&B, throw in your towel and go to the beach! Realizing that everyone has different taste when it comes to getting down and baring most in the sand, this section introduces the some of the many options available on Lido. Getting to and around on Lido. Especially for those who enjoy beaches and nature preserves, the Venice Lido offers lots to do and many places to explore. Via boat, bus, or bike, you can get anywhere you want to go on Lido quickly, easily and inexpensively. 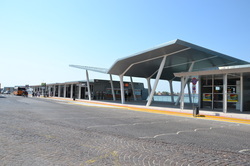 Pictured above is the recently completed boat and ground transportation center at the Piazzale Santa Maria Elisabetta on the Lido. Boats from downtown Venice will drop you here when you come to Lido. From here, you can catch the A & B line busses that run the length of the Island in both directions as well as the Number 11 bus to Pellestrina and the islands south of Lido. 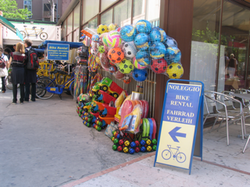 Just across the street, you can also rent bikes. Vaporetto and bus tickets are for sale both at ticket windows and ticket machines located throughout the station. You can also catch a boat to virtually any point in Venice or around the lagoon from here. Beach Supplies on Lido. Many people who visit Venice have never heard of the Lido beaches and don't realize that it's possible to sightsee all day and spend the evening enjoying cocktails on the sand by the sea. So, not everyone brings their beach gear. If you forgot your towel, don't worry! Everything that you could possibly need for a day at the beach is available on the Lido. 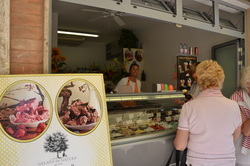 The Gran Viale Santa Maria Elisabetta, the broad street that runs between the Lido boat station and the entrance to the main public beach, is completely lined with stores that sell every kind of beach supply you can imagine. Stop at Rizzo or Billa for portable snacks and water. Pick up 10 euro beach towels from the road-side stands. You can also easily pick up a new swim suit at the many boutiques in town. The key, of course, is remembering to pick up supplies while you're still "in town" on the Lido. Supplies that you buy at the beach clubs are always much more expensive.